Step Ladders & Folding Step Ladder. Step ladders are ladders with broad steps that are engineered to offer foot comfort while climbing or standing. Step ladders provide extra height and reach while cleaning windows, painting, household repair jobs, industrial work areas, changing light bulbs, putting up storage racks in the garage and make the most fundamental tasks easy and smooth. Easy Rack?s step ladders are perfect for homes, offices, schools, industrial and commercial warehouses. Our steel folding A-shaped steel folding step ladders are long-lasting, lightweight, and flexible that folds up and become compact for easy storage. Folding Step ladders hold up to a 6" profile that make for convenient storage in closets and other tight spaces. 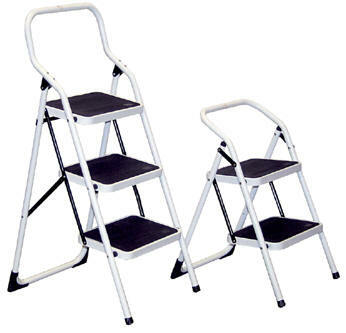 Step Ladder heights are 91⁄2", 19" and 271⁄2" and Stepladder Capacity is 250 lbs. with steel construction and a powder coat finish.